According to The Amp, more than four billion single-use plastic cups are used every year at concerts, sports and other live events. Next time you see a show at The Amp in St. Augustine, there will be a familiar item missing from the venue. 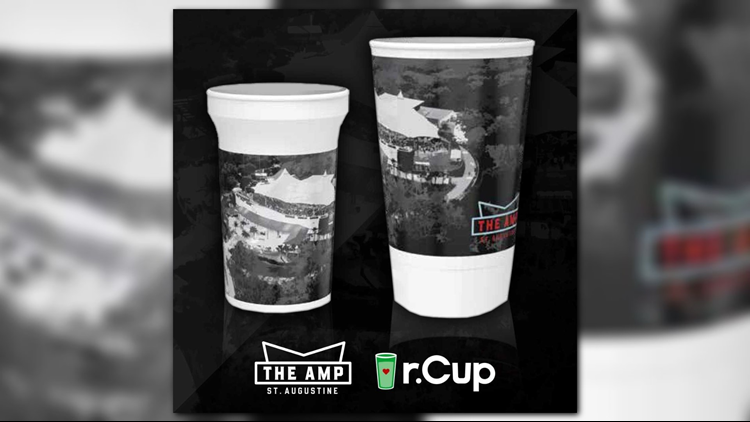 Single-use plastic cups, the item that has plagued oceans and landfills for decades, will become obsolete from the venue due to a landmark partnership between The Amp’s Green Hands Program and r.Cup™, a reusable cup program. According to The Amp, more than four billion single-use plastic cups are used every year at concerts, sports and other live events. At The Amp in 2018 alone, over 300,000 single-use cups were utilized, adding up to a dumpster and a half of plastics at the end of each show. In a joint effort to disrupt this unnecessary waste stream, r.Cup and Green Hands established the first-ever permanent residency program at The Amp. The r.Cup program utilizes reusable plastic cups that patrons may use to refill or reuse with each visit. When patrons purchase their first drink from concession stands, they will also put down a $3.00 deposit for their r.Cup, which will be their cup to reuse throughout the evening. At the end of the concert, patrons can then return the cup to receive a $3.00 cash refund, or they can take the cup home and reuse it at the next event. To learn more about the company and its offering, visit www.rcup.com.